Thursday evening on "The Mark Levin Show," Conservative Review's editor in chief covered the story of Southern California college freshman Caleb O'Neil, who was suspended for videotaping his instructor vilifying President Trump after the election. The professor in question, a gay Latina, referred to Trump’s election as an “act of terrorism.” O’Neil took the recording to the local chapter of College Republicans, which shared the video after complaints to school administration led nowhere. For this, he was punished. O’Neil is appealing his semester-long suspension and will file a lawsuit against Orange Coast College for violating his constitutional rights if his appeal is rejected. But this study in liberal indoctrination is just one example in the higher education epidemic, Levin said. 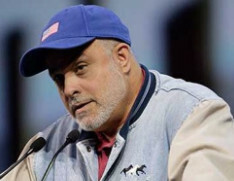 Levin railed against the high costs (and crisis levels of debt) of college in America — costs paid not to educate students, but to pay bureaucrats and indoctrinate kids with leftist ideology. Trump should have his hand on the federal spigot of any school, state or municipality, receiving federal funds, that flaunts immigration law or foments anarchy.